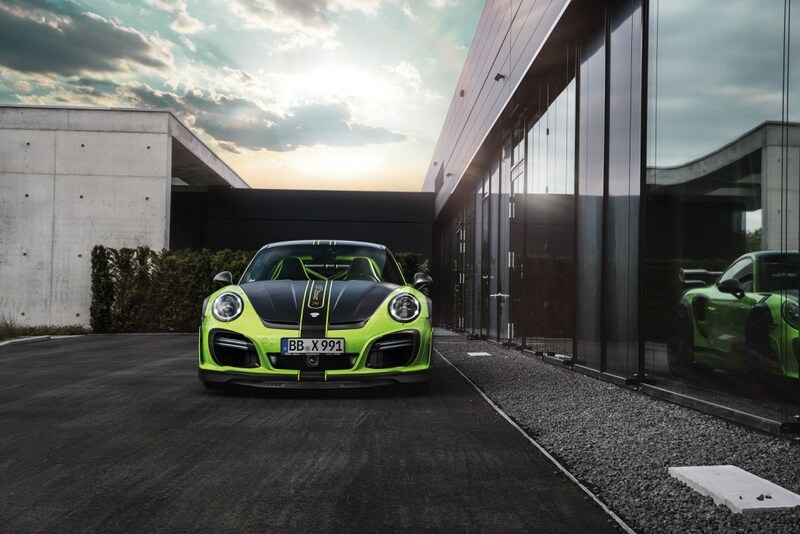 The new TECHART GTstreet R will thrill you. Every second. On the racetracks of the world, or in the streets of metropolitan hotspots – the GTstreet R occupies center stage. Like its legendary predecessors, the new GTstreet R is representing the ideal symbiosis of outstanding performance and unrestricted suitability for daily use. Based on the Porsche 911 Turbo and 911 Turbo S (991), TECHART has built a sportscar that sets new standards. Again. The expressive, lightweight carbon fiber body parts put the 911 Turbo in the spotlight. 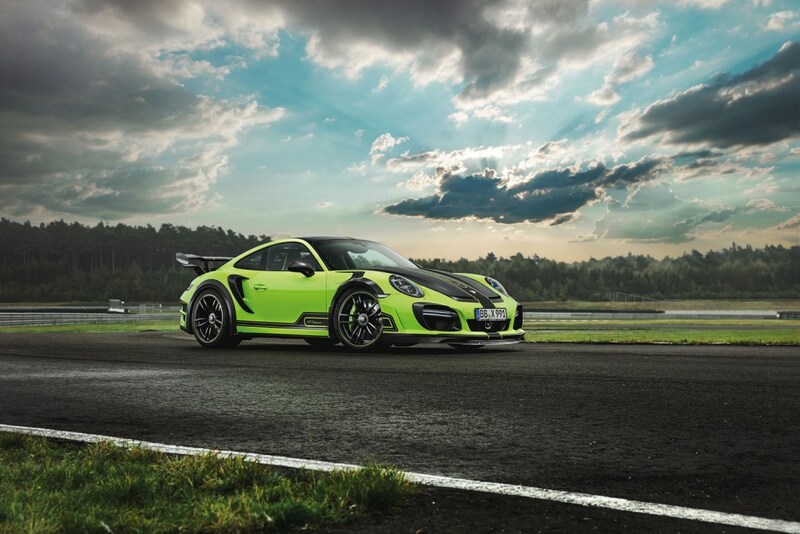 At the same time, the aerokit optimizes the road handling of the GTstreet R by increased downforce. Active aerodynamics provide a total downforce of 321 kg at 300 km/h in Performance Mode. This enables breathtaking lateral acceleration and driving stability at all speeds. The carbon fiber GTstreet R front apron with its active front spoiler lip optimizes the airflow onto the water- and oil coolers with additional air intakes. A central air outlet helps to reduce the aerodynamic lift. The integrated front lights are tastefully surrounded by carbon airframes. Laterally positioned flaps increase the downforce and reduce the drag coefficient at the same time. The lightweight carbon front lid, which bears a three dimensional TECHART logotype at its inside, underlines the vigorous appearance of the TECHART GTstreet R with its dynamic shape. The carbon front fenders feature front wheel arch air outlets. Both, the heat generated by the brakes as well as the overpressure produced by the turning wheels are discharged through racy visible carbon slats. The carbon side skirts continue the GTstreet R design line and interlink the extended wheel arches at front and rear aesthetically. For maximum airflow to the intercoolers, the rear side sections of the GTstreet R feature powerful carbon air intakes. 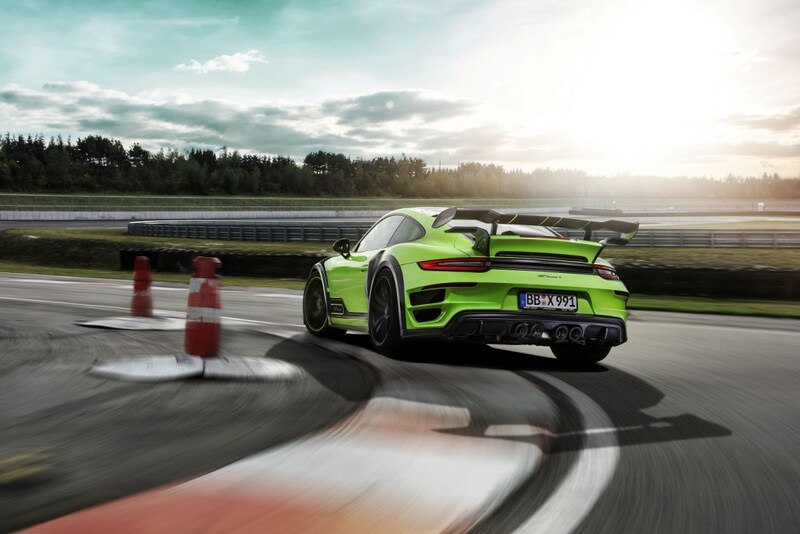 The rear apron incorporates distinctive air outlet ducts – typical for the TECHART GTstreet styling. A trim panel made of visible carbon fiber creates visual impact by connecting the three dimensional taillights. A carbon rear diffusor frames another GTstreet R highlight: the high performance sport exhaust system. Four central carbon fiber tailpipes release the exhaust fumes while generating an extraordinary and powerful soundscape. On top of the engine lid, the active GTstreet R rear wing catches the eye with its contoured carbon wing profile, carbon side panels and two aerodynamic carbon fiber winglets. In Performance Mode, the GTstreet R wing is raised automatically and its angle is adjusted by up to 15 degrees. A large aerodynamically shaped carbon air intake unit ensures sufficient air supply for the engine at any time. 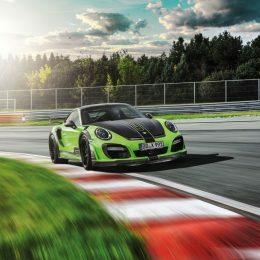 To provide the required grip, TECHART fits enlarged tire dimensions to the GTstreet R. The road contact is ensured by 265/35 ZR 20 tires at the front (also available: 265/30 ZR 21) and 325/30 ZR 20 tires at the rear (optional: 325/25 ZR 21). Customers can chose among 20-inch or 21-inch wheels. 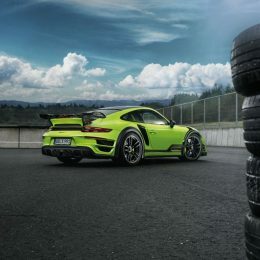 The forged 20-inch TECHART Formula IV Race centerlock wheels are equipped with roadlegal UHP tires. 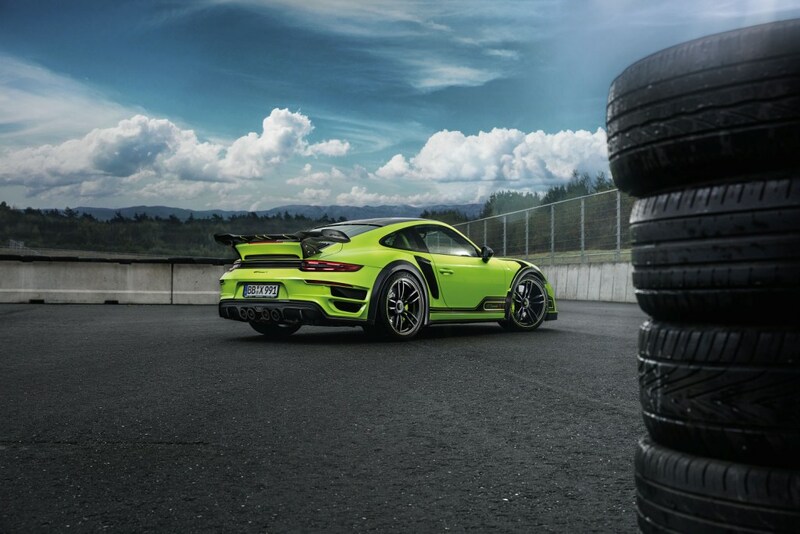 The 21-inch TECHART Formula IV wheels feature a weight optimized rim construction and are equipped with road tires. Both wheels can be individually customized in color and surface finish. 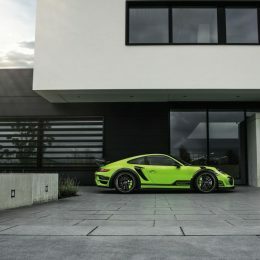 TECHART provides different options for the chassis such as the TECHART VarioPlus coilover suspension with PDDC connectivity or the TECHART Noselift front axle lift system. 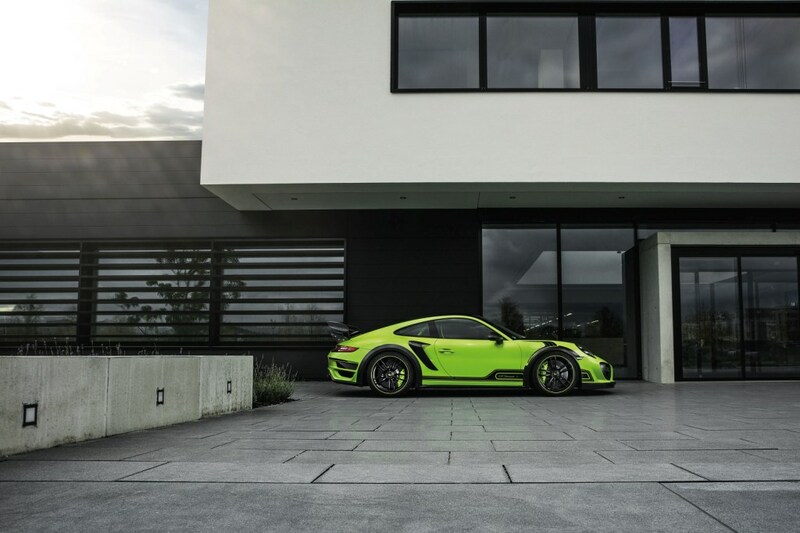 TECHART Noselift makes common obstacles like parking garages, ramps or speed humps a thing of the past as it instantly provides 60 mm of additional ground clearance at the front axle at the push of a button. Individualization of the brake calipers is quality-made with a temperature-resistant coating and ensures a perfect color match. 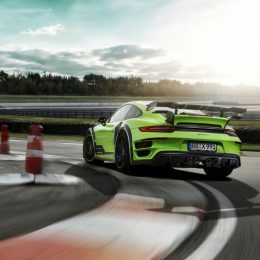 Needless to say that the new TECHART GTstreet R demonstrates its performance skills not only in terms of its visual appearance but also when it hits the road. 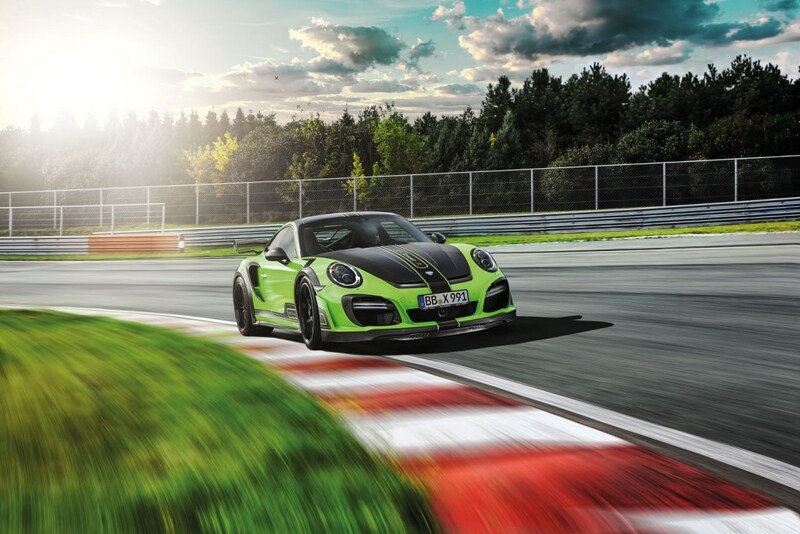 TECHART boosts the performance of the engines of the 991/I and 991/II 911 Turbo and Turbo S models with a range of impressive powerkits, which generate a total power output of up to 471 kW (640 hp) and a maximum torque of 880 Nm. In addition a second stage of powerkits, unleashing a total of 530 kW (720 hp) will be available as of early 2017. 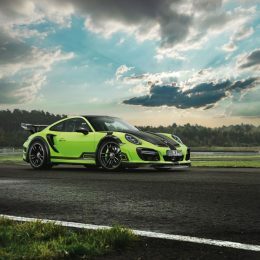 In combination with the 911 Turbos’ active all-wheel drive system, the driving performance of the GTstreet R reaches a new level. 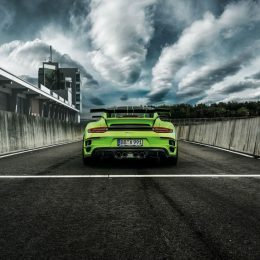 Besides its stunning sound and appearance, the new TECHART high performance sport exhaust system features another highlight. TECHART introduces a continuously variable pneumatic valve control as a novelty in the new GTstreet R. The stepless valve adjustment optimizes the exhaust back pressure depending on different load conditions and avoids unwanted frequencies effectively. 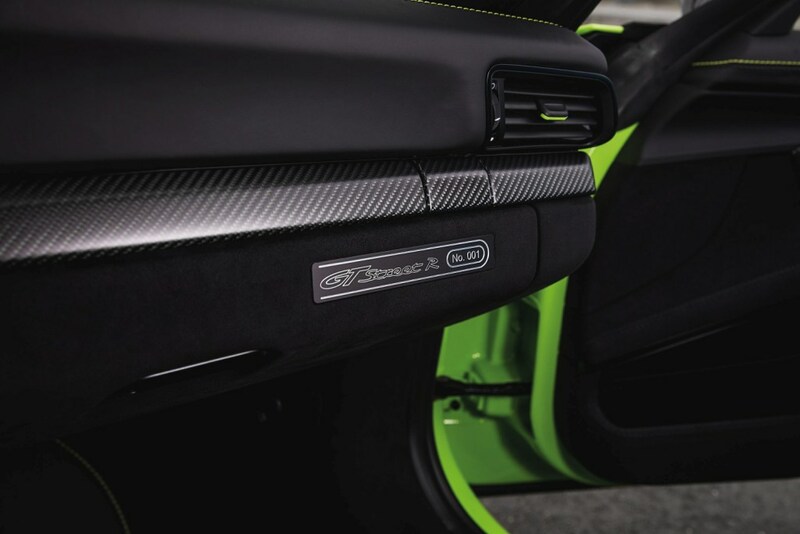 Entering the new GTstreet R, the whole know-how and workmanship of TECHART’s interior manufactury reveals. 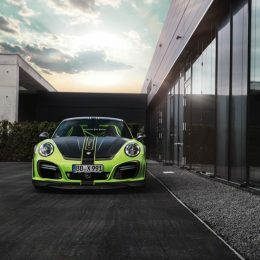 TECHART created two different GTstreet R interior variants. The interior package »Exclusive« flatters with finest leather, the »Clubsport« version sets sport-focused Alcantara highlights. Among a wide range of refinement options included in both interior packages, the »Clubsport« interior includes a color-matched roll bar, 6 point harnesses and door opening loops. Both interior versions come with door panel inserts and seats with GTstreet R design stitching. Dashboard, center console, roof liner, sun visors and door pillars are covered in leather or Alcantara. The mode switch at the steering wheel, the air vents, the air vent adjusters, the PDK gear selector, the gear lever surround and the seat adjustment are lacquered in custom color. 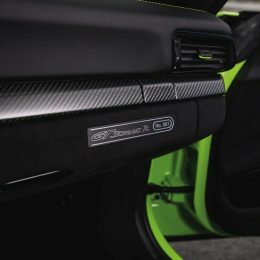 As an option, TECHART carbon fiber interior parts complete the tailormade surrounding, such as trims, panels or seat backpanels in different visible carbon fiber finishes, to mention a few. Settled in the sport or in the sport bucket seats, the ergonomic TECHART sport steering wheel awaits the driver. Coming with a smaller diameter, a straight-ahead marker, paddle back-covers as well as fully individualized in terms of colors and materials, no wishes remain unfulfilled. Color-matched instrument dials, door entry guards and aluminium sport pedals round off the unique interior design. As a sign of exclusiveness and originality, the glove compartment features a milled GTstreet R signet with a sequential number on its lid, and, inside the glove compartment, an exclusive handmade GTstreet R wallet contains the vehicle documents.